REKO Olari had its first meeting last Thursday at 5pm on Kuitinmäki school carpark. I had been taking orders all week on REKO's Facebook page but I had to teach on Thursday evening so Fredi took control of logistics operations. He was rushed off his feet as the sale only lasts for 30 minutes and I had sold over 30 pots of Friisilä honey. 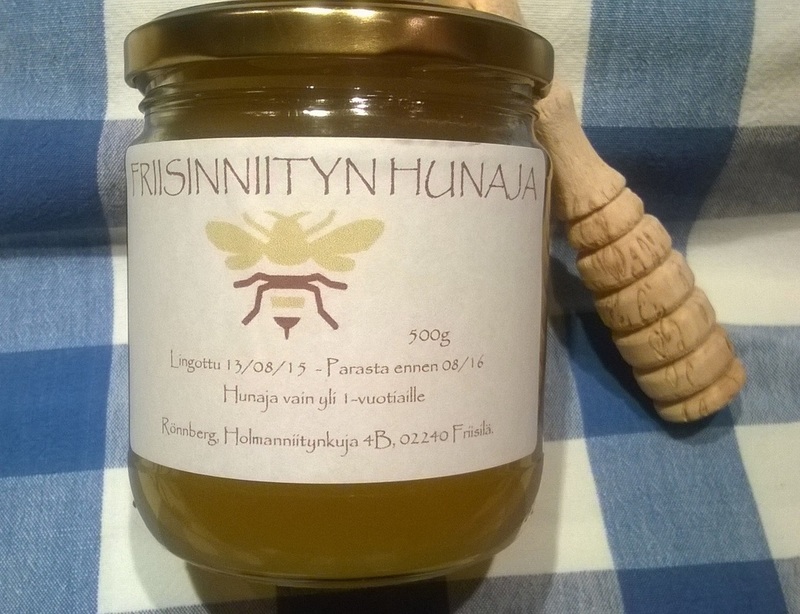 The honey from our Espoo garden is now sold out. 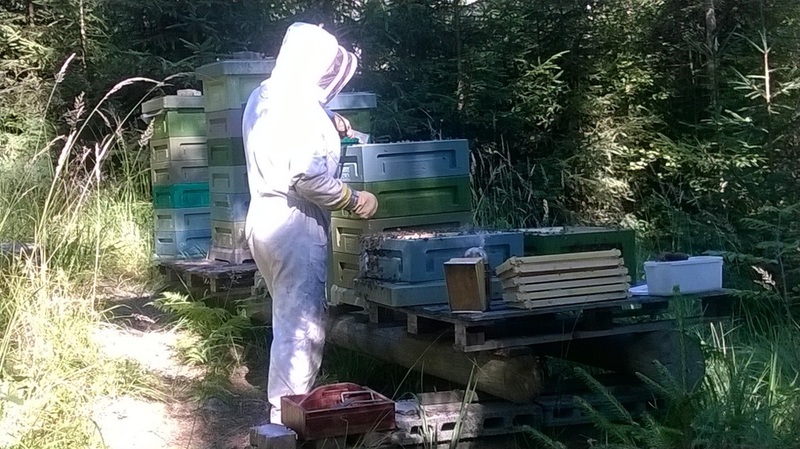 We were thinking of taking some of the hives back to Pojo but now we aren't so sure. With so many customers locally it would be a shame to produce less. 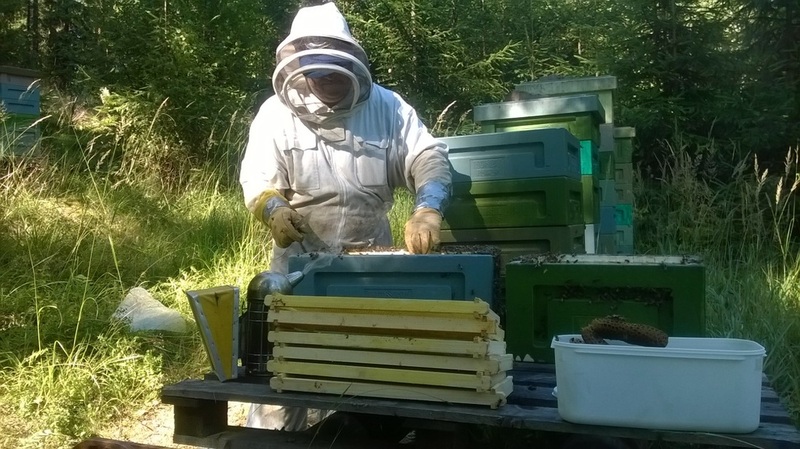 Our Espoo hives are healthy and productive and they have such a great supply of food in the local community. If swarms weren't a problem, I would definitely leave them here. 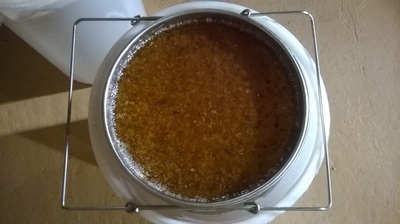 I potted a random batch of liquid honey at the weekend. it was very dark, probably heather. The remaining two containers from the last harvest had started to crystallise naturally so they will be potted in plastic pots. 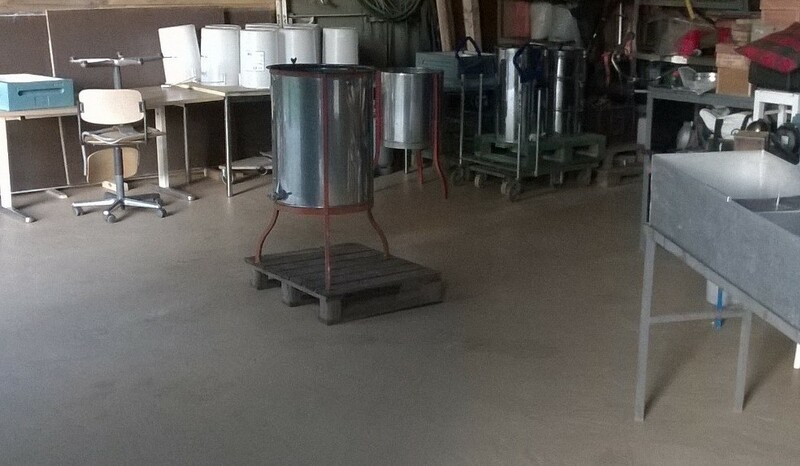 Glad it's over - now we have all the sugar-feed containers to clean and then we need to treat the hives with thymol before the winter to keep the varroa off. We will take some of the Espoo hives to Rosendal and put them behind the root cellar where there is a huge area of wild raspberry and, of course, the saskatoons. 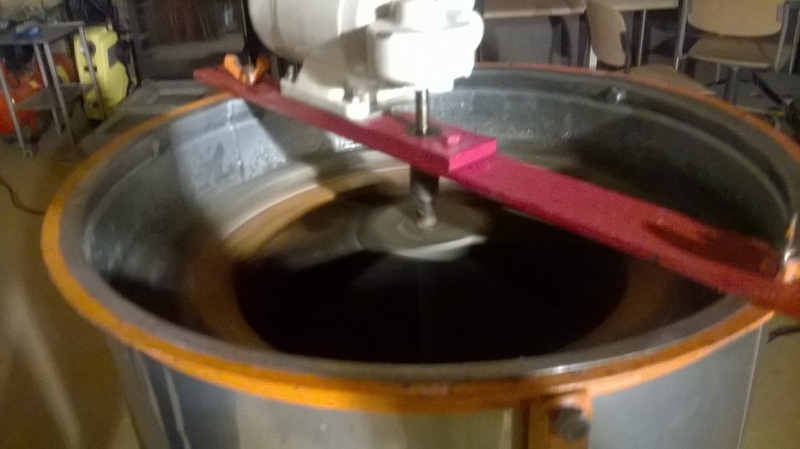 We finally collected the last of the honey from the Espoo hives and put it all through the spinner on Wednesday night. We are selling honey at the Maan Maut farmers' market in Fiskars this weekend (today and tomorrow) and in the Slow Food Helsinki in Betania, Helsinki next Saturday. It is also in the Kottkontrolen butchers' shop in Karis and we'll eventually take some to a couple of other local shops. A boring weekend potting and packing. We forgot the labels in Espoo so none of our pots have the *Best Before* date yet. We're not finished, only about half way through the crystallized honey but the Espo harvest is potted: being so runny it is much quicker to deal with. 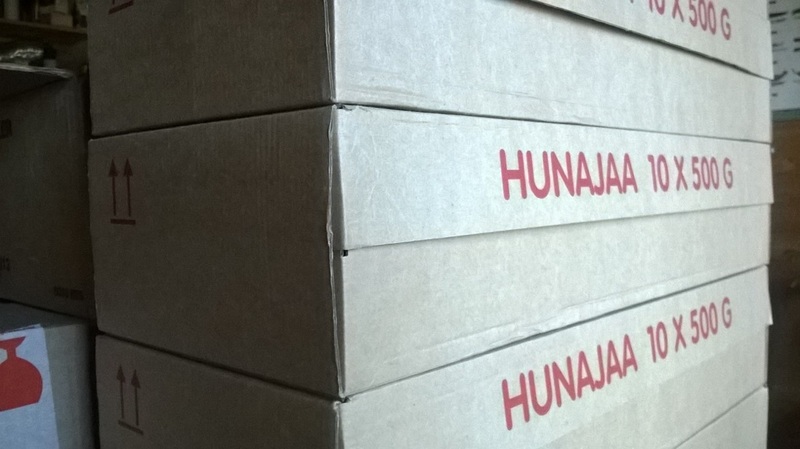 We make our own labels for the Espoo honey so that will be my next job: a bit of graphic design. I'll probably use the same as last year and just change the date unless my chief accountant agrees to buy me a colour printer! Early summer was extremely wet and now we have had almost two weeks of sunshine and no rain. 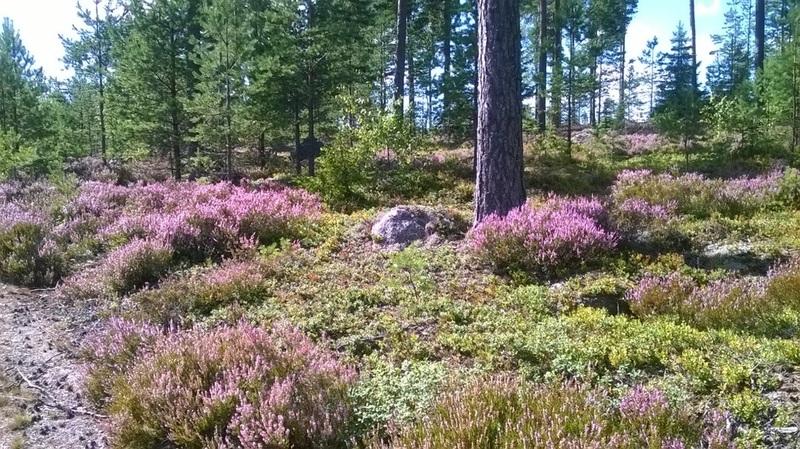 The forests are an explosion of colour: I have never seen so much heather in flower. We drove back from Fiskars on the forest roads and it was like this all the way. Amazing. So, we have decided to attempt a second harvest next weekend. We will pot the second harvest separately as it will be completely different to the first. The Espoo harvest went much better and much quicker than we had anticipated. First of all, the neighbours were all away (a coincidence, since we hadn't warned them). Secondly, we had a *new* smoker and lots of smoke pellets. Third, it was not too hot, in fact there were even a few drops of rain but not enough to stop the proceedings. We made a bit of a false start when Peter put his hat through the mesh on his bee suits. I had to thread a needle and do some quick but essential repairs before we could start. The bees were a lot LESS aggressive than last year and the hives looked great: The three established hives all produce around 20 frames (Farrars) each and the three new hives (the swarms we managed to catch) have healthy queens and plenty of brood. We will take them to Pojo and install them in Rosendal out of the wind and close to the cleared forest which is now covered in raspberry. 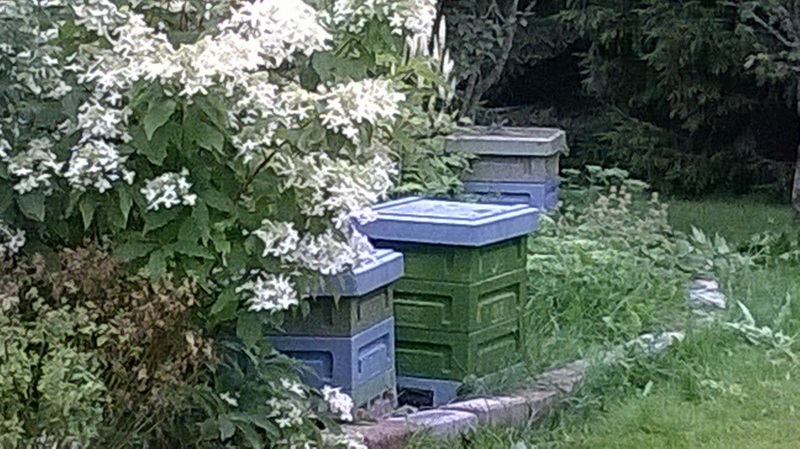 After we finished Peter asked me to clear the weeds in front of the hives which is safer to do in a beesuit. I was so confident the bees wouldn't bother me I actually removed my gloves because they were three sizes too big. And I got stung. But only once and it was really no big deal. My own silly fault. Now the hives are reduced to three Farrar boxes with some spare frames on the top as they are still out there foraging. We loaded the covered frames onto the trailer and took them to Pojo for spinning. No bees were transported! Only honey. 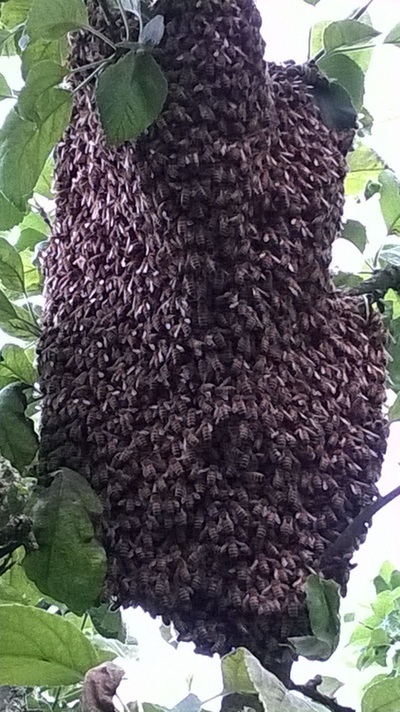 We hope to harvest more honey from the hives in Pojo at the end of this week, or next. Fred is here to help and with three of us in the workshop we manage to get to bed at a decent hour. 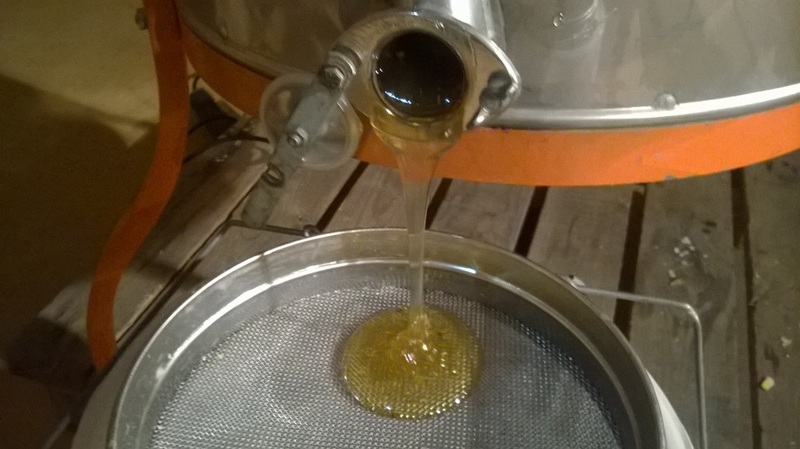 The bottleneck is the filtering as the honey is quite thick and takes ages to go through the metal sieves which filter out the impurities (such as bits of wax,, pollen, bits of bee etc). 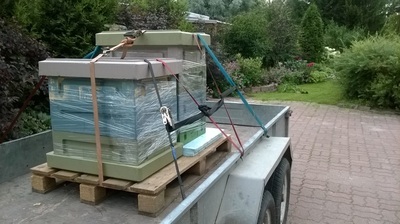 Tonight we will finish all the frames from here in Pojo and then we can start on the Espoo hives over the weekend. The filter stops pieces of wax and pollen getting into the honey. We worked until about 3 am but did not finish spinning all the frames. 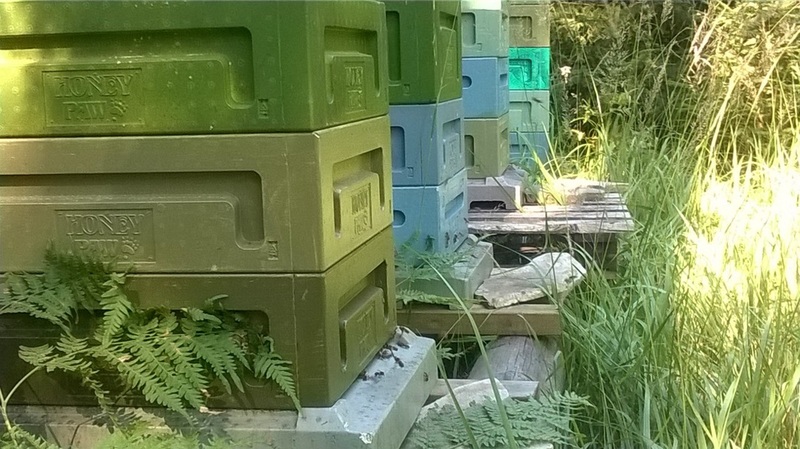 We also have hive #2 to empty and then the Rosendal hive as well. 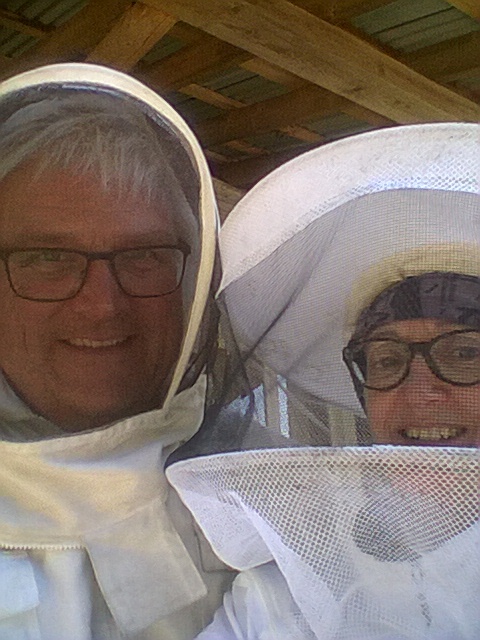 We will take the frames out of those two hives today and then do all the remaining spinning tonight (with Fred). 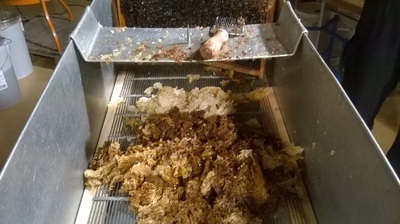 The big Langstroth frames are very difficult to spin as the honey is thick and sticky. Some of the Farrar frames were huge and heavy with really nice honey. We had to leave a lot of uncovered frames in the hives but maybe next week we will go back and remove them if they have been sealed by the bees. 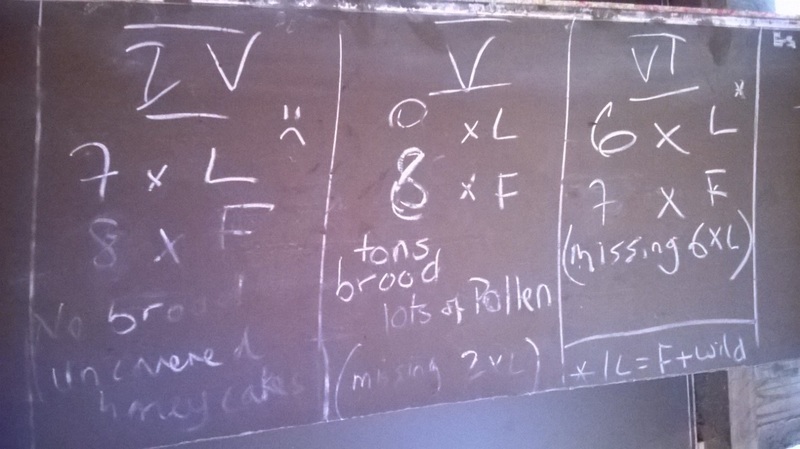 Removing uncovered frames can change the humidity levels of the honey and maybe result in some fermentation. Here at last, we have some honey. The yield isn't great this year - maybe half what we had last year. We think this is probably due to all the rain we had when the raspberries were flowering. The honey factory is ready to roll. We now have a clean floor and lots of space for storing, de-waxing. spinning and drinking coffee. This is out third year so we are better organised and hopefully more efficient than before. 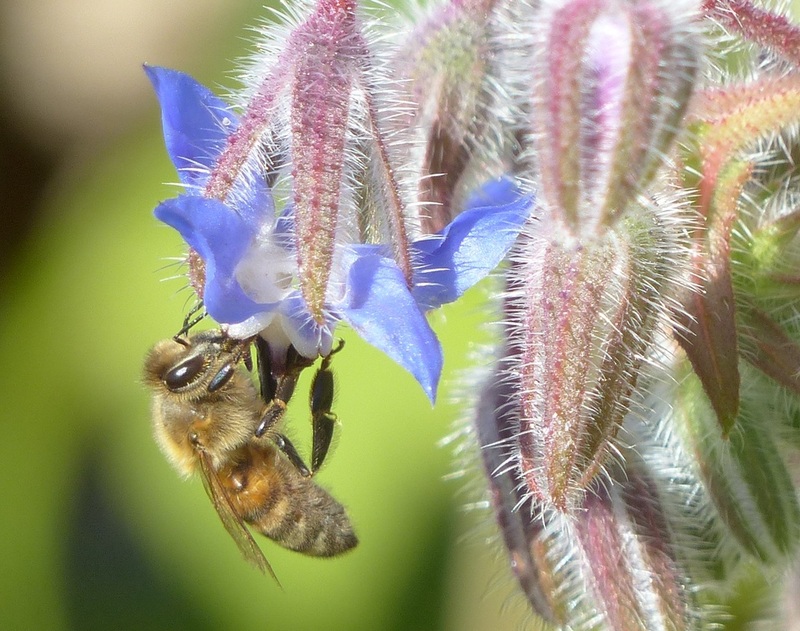 A lot depends on how hard the bees have worked too. We can't remove frames that haven't been sealed (with wax) because then the honey is too 'watery' - which means it spins quicker but also means there are conservation issues such as fermentation. Comfy shoes, good music and lots of vinyl gloves required... it's sticky work and tough on the tendons. The big clear out / clean up... It's harvest time! 2014 - Peter, de-waxing a frame. 2014 - Me in a suit, smoke and the all-important pencil and paper. We have decided to start harvesting the honey this coming week. The initial phase is the Big Prep which entails clearing out the workshop, washing the floors and installing all the equipment including the spinning machine, the table for scraping the wax off the frames and the honey buckets which all have to be thoroughly cleaned before we start (they are stored in a shipping container during the winter, but even so, they still need a proper clean). We also need to sweep out the root cellar. Meanwhile we will start removing the frames from the hives. That is a mammoth task in itself. 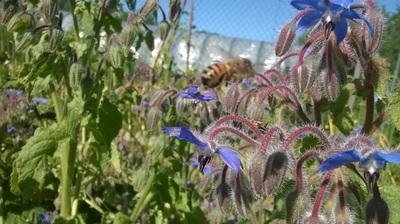 We have to choose a day when the bees are out foraging: warm, dry, sunny and wind still. There haven't been many of those recently! Then we prepare the smoker and get kitted up. 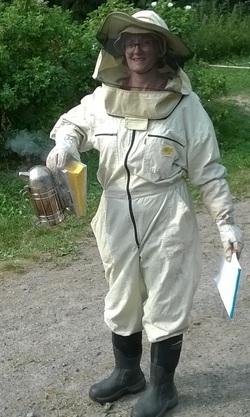 The bees do not like us raiding their hives and they can be aggressive so it's a good idea to wear a thick layer of clothing (or two) under the bee suit. We also check the suits for any rips or tears, especially the gloves and the sleeves. The frames are removed from the hives during the day but the de-waxing and the spinning takes place during the night when there are no bees around. It is also cooler. We get ourselves suitably organised: tea/coffee, biscuits, sandwiches, music/radio, comfy shoes. In the past we have worked through consecutive two nights. Last year Tom helped but he will be in Norway. Maybe Fred will help. Once the honey is spun from the frames we store it in the root cellar for 3-4 days while the crystallization process is managed. 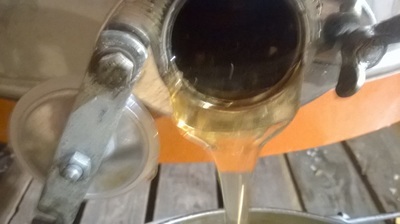 This involves stirring the honey occasionally until it starts to thicken and it becomes lighter in colour. 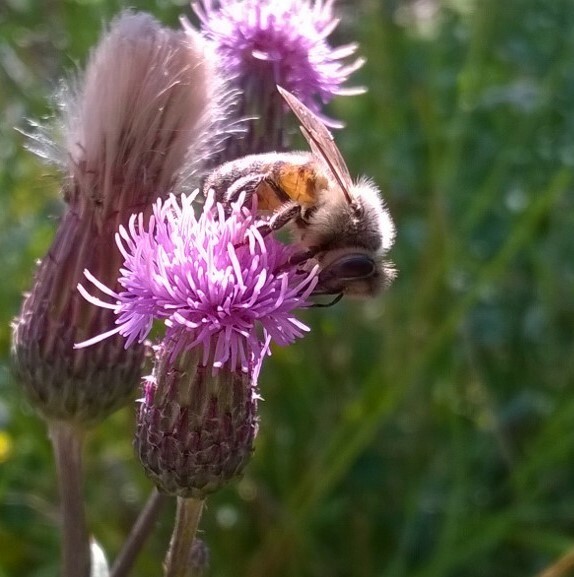 Yesterday was quite warm and sunny so the bees could make the most of the rosebay willowherb which is still in flower as well as the clover. There is a strong smell of clover in the air. Unfortunately today is a no-fly day as we have had persistent rain since midnight and it will continue into the evening. 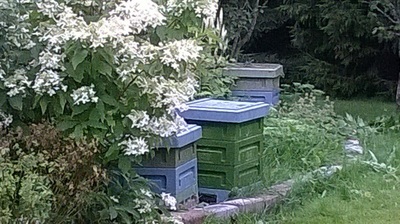 Looking at the local "vaakapesa" the hives are still increasing in weight, maybe dropping slightly when there are 2-3 rainy days in a row. 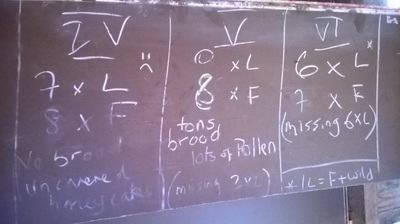 We definitely have "honey cakes" ie frames that are full of honey and sealed, but it is difficult to estimate the quantities. Planning ahead, we will go to Tampere next week to pick up the pots and jars and think about harvesting in the first two weeks of August. This is problematic from a logistics point of view since we have so much else going on in August -we will have to recruit the kids to help! 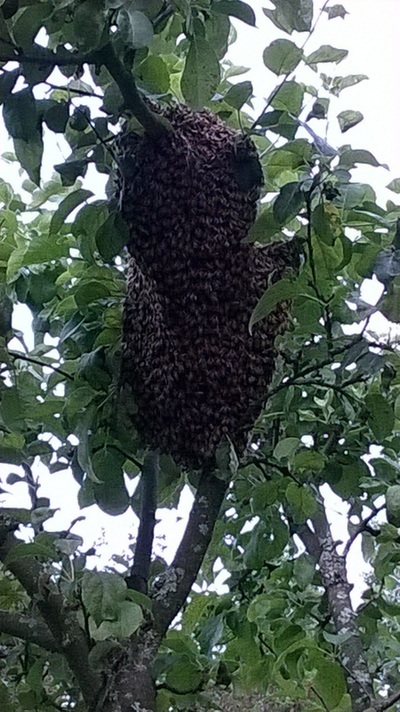 They are quite docile when they swarm, I could get up really close to take this picture and I wasn't even wearing a hat. They fill themselves with food before they fly out with the queen. 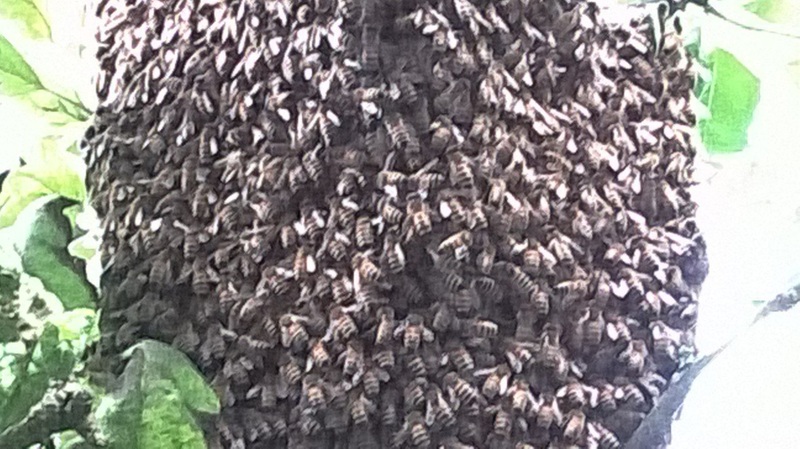 It is always the same hive that swarms (this was the first warm, sunny day for weeks) so there is definitely a rogue gene pool in this colony. It means we should really think about buying in a new queen. We only had one suit here so Peter had to sweep them up himself. He put them into a small temporary hive (a lure) with a frame of brood from the old hive. Now we have to decide whether to merge the temporary hive back in with the old hive or not. 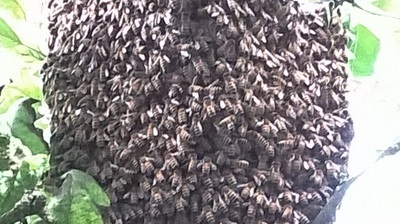 Swarming really disrupts the honey production cycle. With the bad weather we are looking a meager harvests this year.